I have had a lot of people ask me about baby showers and such, like when do you have one? when do you want one? etc. We could have a baby tomorrow or we could have a baby in a year. With adoption it is soooo up in the air when it comes to a timeline, especially now that we are adopting domestically. Bottom Line...we will have a baby. I'm pretty much faux-pregnant right now! There are so many things that I buy because I need to be ready, any day. My friends will say "don't buy that, you will get that at your shower!" 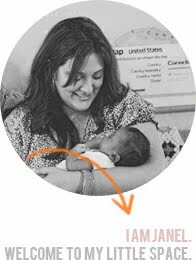 I keep buying everything though because if I get a baby tomorrow they will need to sleep somewhere, we will need to have a car seat to bring them home in, clothes to wear, bottles to drink from, etc. Has anyone gone through this with an adoption before? What do you do? 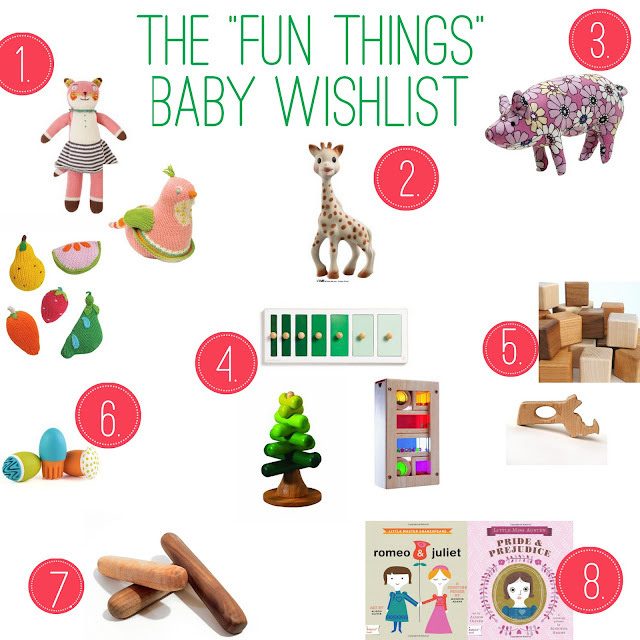 Anyway, to the point of this post, I wanted to share with you some of things that I have on my baby wish list. I'm not registered anywhere because there isn't a shower in the works. I have made my own little wish list on Amazon that I purchase things off of when I can afford them. I am the kind of gal who wants to be READY! I love the idea of eco-friendly toys and hand made toys (obviously). Does this mean my child will never play with Barbies or other plastic toys, absolutely not. These are just some items that I think would be lovely to have upon our baby's arrival. Learning toys, and cuddly toys. Also, if you haven't checked out those books yet (number 8) you need to. They are amazing! I saw them over at Modern Kiddo the other day and wanted to order them immediately! i've never adopted a baby, but i think what i would do is get the minimum of what you need for when now. so....some diapers, bottles, etc. and then have a shower when you actually have your baby. it would be a great way for your family/friends to meet the baby, but also give you some great gifts as well :) or, you could get everything you NEED now...and have your friends/family get stuff off of your fun list, or each have them get her their favorite children's book, or something sentimental like that. "i'm pretty much faux pregnant right now"--hilarious. made my day. We had an "essentials" shower - friends got us plain onesies, sleepers, a moby wrap, some diapers, bottles and a few swaddling blankets. That's all you'll need for the first month anyways. The fun stuff I am waiting for (toys, cute clothes, gear). i can't wait to see list #2 :) I'm addicted to your blog lately!